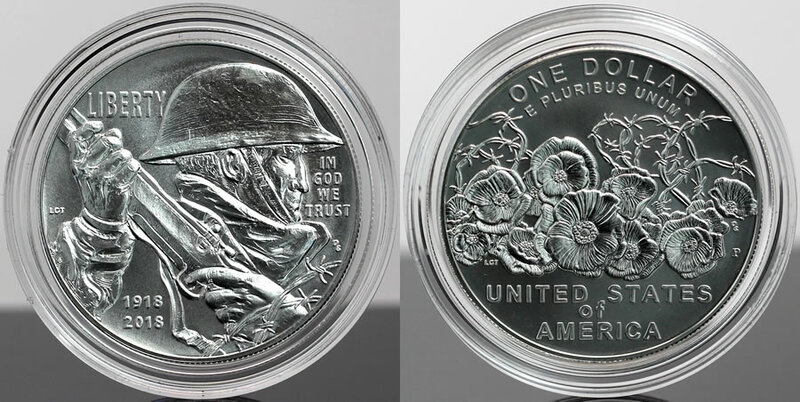 First-day sales of the World War I Centennial Silver Dollars reached 17,287 for the proof and 7,468 for the uncirculated, according to United States Mint spokesman Michael White. Commemorating the 100th anniversary of America’s involvement in the First World War, the two silver dollars along with five silver medals launched on Jan. 17. The medals recognize the Army, the Navy, the Air Service, the Marines and the Coast Guard — branches of the U.S. Armed Forces that were active in WWI. Proofs routinely outsell uncirculated coins so their 2.3x stronger showing in the early going is of little surprise. They have added support in this instance since each silver medal is paired in a set with a proof WWI Silver Dollar, and the medals are not sold separately. The silver dollars are available at introductory prices of $51.95 for the proof and $48.95 for the uncirculated. They have a combined mintage cap at 350,000. The five sets are $99.95 each with no more than 100,000 available. The silver dollars are already shipping. Fulfillment of the sets is expected to begin in late May. Order the dollars or sets from the U.S. Mint’s commemorate section right here. The grid below shows how many silver dollars and sets sold from their release on Jan. 17 through to Jan. 21. Any numbers on the sets? Wow low number so far for the uncirculated and not that high for the proof either. With the population of veterans mostly gone not going to be a huge pool of interested buyers. Probably collectors & family members of WW1 Vets. I think the Mint over estimated the appeal with a cap of 350,000. As for the medal sets I hope they don’t do well. The only reason being is that they are being paired with a WW1 proof dollar. So if you just wanted to buy the medals you would have to pay about $500 to get all 5. Stupid decision by the Mint and hopefully people showed the stupidity of that decision by voting with their wallets!! Big future in us mint “ZOMBIE” coins and whimpy looking eagles Go Navy!!. I still do not understand how this obverse design was approved by the CCAC – or why the Soldier was given such a harsh and distorted appearance, if the coin is successful in sales, it’ll be only because it’s out of respect for the contribution of Americans during WWI and the anniversary itself, certainly not because of any great admiration of the design. I shudder to think how the Mint will butcher the commemorative coin for WW II, if there is going to be one .. This dollar coin and medal combination set could have been a huge success, as far as sales go, if the dollar coin had the same mint mark as the medal in the set. Also for the sets with the medals with the P mint mark make the dollar coin different than the Proof version that is all of the 5 sets. That would have made 7 different dollar coins including the Proof and UNC coins that are also offered as individual coins. I would think there would have been minimal additional cost to make the 5 different dollar coins. Only my opinion. Mayne I thougjht I was ‘harsh’ SO… I looked @ the WW1 enlarged as above, and it is truly not bad, it’s AWFUL, ugly design, incorrect ergonomically & historically & a CROWDED design? Looks like a mess…we needed a giant rendition of Rocky Marciano playing like a lefty dougboy…I can tell you this The Mint is not getting my dough boy….. So, I did go in to this one, but not with my eyes open. I bought the proof version, an uncirculated, and all 5 of the medal sets. With the subject matter I was never not going to. But when I received the proof and uncirculated coins, I was a little disappointed in myself. I didn’t realise that it was only 90% ag, AND I didn’t realise how far short of a troy oz it was. I see silver dollar, and just assume it’s an ounce of silver. No… the Silver dollar is 26.7 grams of 90% silver and this specification has been in place for a very long time, I believe since machine-pressed dollars were minted in 1836 – A Silver dollar is worth $1 in silver when the metal was officially priced at $1.31 per troy ounce. Since it became a commodity with a movable price, the metal was removed from most countries coinage since it was no longer possible to produce coinage at their exchangeable value. They also differentiate from the silver ounce bullion dollars introduced in 1986 which do contain a full ounce of .999 fine silver. “Soldier’s Charge” … with eyes closed .. sleep walking across a field full of barbed wire over uneven ground and enemy waiting in trenches with fixed bayonets . ,, holding the rifle in the wrong hand .. possibly the wrong type of rifle, and a vague looking “uniform” .. some charge …. might not even make it across .. well with eyes closed he might end up going in the wrong direction .. a truly sad design to commemorate the services of those of served in WWI … maybe if regular folks could get to see the runners up .. to see the “attraction” of the “winning” design ..
Bizarro obverse design all right, and the date doesn’t make sense. America entered the war in 1917. The year 1918 was the end of the conflict (though actually the US was mixed up in the subsequent occupation of the Rhineland and the invasion of Russia), so maybe that’s being commemorated instead of our entry, though that’s already been done. It was called the Peace Dollar. Frankly I don’t see there being a lot of interest in this coin; there are no veterans left–heck, there are almost no children of veterans left–and the war was overshadowed by the 1939-45 conflict. Even that’s ancient history to most Americans. Tinto interesting… WW1 was years of Generals sitting behind door or maps ordering tens of thousands of young men to march into machine gun fire or poison gas, many would flee but most walked into death, disfigurement or blistered lungs. Old soldiers meeting 20th Century military tech, it was not pretty, only time & more tech Tanks, planes & the US joining moved the lines. it’s actually a rare picture, the dollar has a left handed bolt actoin Rifle, not alot of those were used I would guess? Since we won’t publish our weekly article on U.S. Mint sales figures until Thursday, Jan. 25, I’ve updated this article to include the latest WWI Silver Dollar and Silver Medal sales through Jan. 21. Thanks for the update. Very interesting. I thought the numbers would have been higher. If it wasn’t for the Medals, the silver dollar would have been a near bust. I’m not sure these numbers will change much going forward, unless the “As Seen on TV” coin hustlers decide there is profit to be got here. Thanks Mike for the updated #’s and breakdowns! Gary – What Chase Barber is saying, the old *vets from WW1* rose from the dead and and bought a few,lol. Yeah would be pretty rare I’d guess, too. How many % of a population is left handed? One would think during that time period the military would have the soldier learn how to shoot/handle right handed rather than giving him a left handed rifle if they even had those in stock, that is .. not to mention the additional cost of having to specially make left handed rifles and keeping them in separate inventory .. Check out the eagle on the 2008p silver eagle dollar coin, now that’s an eagle design!!!! GO NAVY!!!! they only made 294000. Bald Eagle Proof Commem 2008-p silver dollar coin, can be purchased from APMEX. check it out!! !